This post will focus on the Community Leadership Summit, a free event held the weekend before OSCON. The Community Leadership Summit brought together community leaders, organizers and managers interested in growing and empowering a strong community around their projects, products or business. 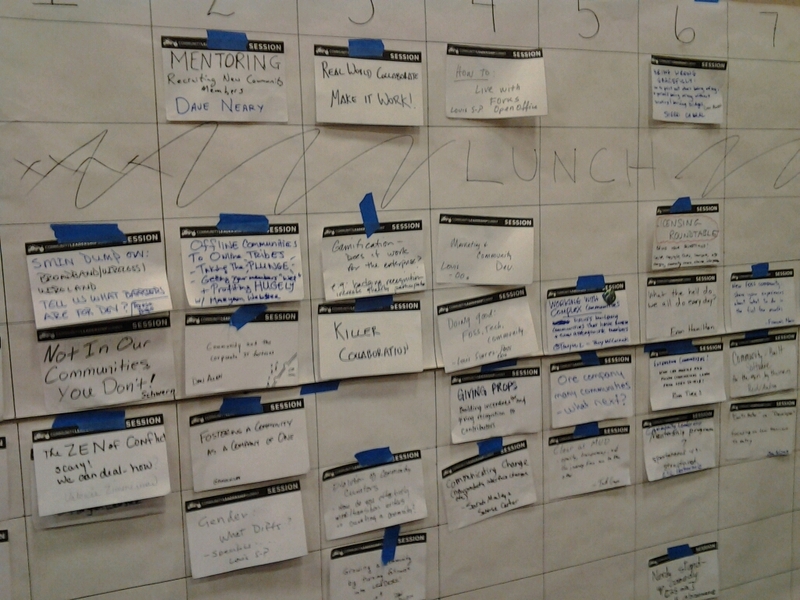 My initial motivation for scheduling to attend OSCON was to participate in the Community Leadership Summit. This event was introduced in 2009 by Jono Bacon, community manager for the global Ubuntu community. The purpose of event is to cater to the growing community manager profession, serving as a first step in helping community managers and leaders define and refine their work, share knowledge and make connections in a vendor neutral way. I've followed Jono's work for many years, read his book The Art of Community and have been taking on an expanding community role myself at JBoss. I figured it was a good time to learn from my peers about how to be a more effective community leader and share some of my own success stories. According to Jono, we are entering a renaissance of community management, so what better time to get involved? Since the summit is a free event, I wasn't sure how many people to expect. Turns out, this is a pretty hot topic. There were nearly 200 participants. Since the event originated out of Jono's work with the Ubuntu community, I assumed most of the people would be open source community managers. That was certainly not the case. The group was surprisingly diverse and included employees from Adobe, Microsoft, Uservoice, Rackspace, Google and more. 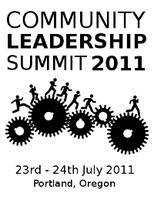 That supports the claim that the Community Leadership Summit is a strongly independent event. Indeed, Jono often reminds us that no company should have a monopoly on community. The Community Leadership Summit is a barcamp-style unconference, which means the sessions are roundtable discussions proposed by attendees and scheduled at the start of the day. Session notes, and other information captured during the event, were posted on the Community Leadership Summit wiki. There was regular chatter on twitter, which you can follow by searching for the hashtag #cls11. To get eyes on the event, check out the stack of pictures Mark Terranova snapped. What was most surprising to me (or perhaps just unexpected) is that most of the participants were eager to propose a session. Then again, this was my first unconference, so perhaps that's typical. Either way, I like it. There was no shortage of topics (the board from day one shown below), too many to choose from in fact. That's a good thing, as it kept the conference interesting. Originally, I thought the conference was just one day. I had no problem committing when I found out it was two days because I knew there was a lot more to explore. Some people even suggested extending the second day, if that gives you any indication of how engaging the conversations were. I moderated one session each day. You can follow the links to see the notes I wrote up about the session. One of the challenges in open source is that some companies don't have a focus on good. Rather, they have a focus on benefiting shareholders and harming competitors without regard to how their actions affect the community. This session focused on how to reconcile at a personal level being labeled as evil and how to act towards the community when conflict arises. I attended to learn how I can help Red Hat steer clear of making decisions that damage community trust in the name of short-term (or short-sighted) gains. The community is essential to sustainability. I pronounced that if the two became estranged (and I discovered myself working for an evil company), I would side with the community since that is where my reputation is most valuable. UPDATE: Simon Phipps, who hosted the session, shares its premise in his blog entry The Long Road To (Software) Freedom. In the entry, he suggests one model for the journey a company may take towards embracing software freedom. This model may be a valuable tool for community managers who work for large corporations at various stages of this journey and are often faced with the responsibility of fielding negative perceptions of their employer. For those of you working for software companies, how far along is your employer? One Company Many Communities: What next? This session brought together individuals currently facing the challenge of managing multiple, often disparate communities within their company. Red Hat has several layers of this problem. The most obvious is the independent Fedora and JBoss Communities. Going deeper, there is a customer community and independent open source community in each camp (RHEL/Fedora and EAP/JBoss). When you look in the JBoss Community, you find a whole range of additional independent communities, struggling to remain linked through the jboss.org infrastructure. Aside from reflection, the value I got out of this presentation is the acknowledgement that one size does not fit all and that the linkages must emerge and be fostered rather than forced on the communities like shackles. This session explored the role between community managers and marketing. After sharing some stories, we all agreed that at some point, community managers wear a marketing hat. The question we tried to answer next was, to what degree? In small companies, the community manager and marketing may be the same role. In larger companies, there will no doubt be a dedicated marketing person or team. Regardless, the work the community manager does will touch on marketing and thus should have a relationship with the marketing team. As to whether the community manager is in the marketing or engineering department, that will vary from company to company. I certainly recognize that I engaging in marketing when I talk about the technology at conferences, plan software launches, select project logos and so on. This talk wrapped up the weekend with a discussion of how to communicate the value of the work we do as community managers to our company. We arrived at two tools, stories and metrics. Stories relay value through emotional and personalization. Metrics relay measurable impact. When using metrics, it's important to focus on relative change, not absolute numbers. I frequently use stories, but now I recognize that I need to balance them with metrics. I'll be studying the recent work done by David Eaves for the Mozilla community and David Neary for the Meebo community in this area. After day 1, we got a real treat: a comedy stand-up routine that only a geek would truly appreciate by FLOSS geek and feminist Sumana Harihareswara (@brainwane). Geek out! The best things in life truly are free. HBO, eat your heart out. I was also thrilled to meet a colleague at the event, Adam Williamson, Fedora QA community manager/monkey. Although we didn't plan it (honest, we never met prior to that weekend), the event served as an excellent catalyst for building a bridge between our respective communities, Fedora and JBoss. We shared many stories, workflows and values. I'm amazed how many awesome people work for Red Hat. Hopefully we'll look back on this event as a key turning point for bringing together these surprisingly isolated communities. UPDATE: Check out Adam's blog post about his experiences at the Community Leadership Summit. Without a doubt, the event was very worthwhile, even more interactive than I anticipated. I definitely picked up some good advice and strategy for managing communities. Above all, I recognized how much I enjoy working in a community role and how much more I still need to learn and explore. This event is no doubt just the beginning. There was some talk of organizing a CLS East in either New York or Philadelphia. I'm definitely interested in continuing the conversation about community leadership. I'd also like to encourage Red Hat to become a sponsor and send more employees to participate. JBoss Community application for the GSoC 2012 program accepted! JBoss Community application for the GSoC 2012 program submitted!